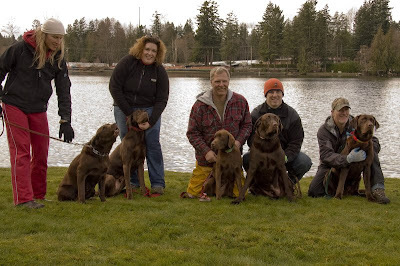 Family portrait - (left to right) Jazz (the mother, barking), Clyde (second litter), Maddie (2nd), Gunner (1st), and Tank (2nd). Usually Clyde is the biggest Labrador at the dog park... Not with his two brothers around. Clyde went and jumped of a dock for the first time this weekend. We have a bit more practicing to do before he wins any prizes... He pretty much dove straight down off the end, going under for a bit. Pretty funny to watch. Eventually it'll catch on for him, he flies off the retaining wall in the backyard with out hesitation.